This weekend I was with my dear friend Nina at a charming little grocery store on Long Island. As usual, when I was paying, I fumbled in my wallet, dumping the coin-purse part upside down into my cupped hand in order to rid myself of all the dreaded change which weighs down my pocketbook. "I just hate loose change, don't you?" I remarked to Nina. "Well. Yes....but I guess I'm always afraid of being the jerk at the front of the line whom everyone hates because she's taking up time while she fishes in her wallet for correct change," said Nina. Ouch. And also, BINGO! Because, in a snap, just like that, I recognized one of the most fundamental differences between living in Paris and living in the U.S.
At first blush, it might seem like a trivial difference, but it runs deep. Do people in France even keep change jars? Does Coinstar exist in France? I think not. I never saw any. Does anyone ever go in to their local bank branch and ask (instead of for quarters), "I'd like a roll of one-euro coins, please?" The very thought gives me the shivers. The penny dish by the cash register? Ubiquitous in the U.S., preposterous in France. Small change, in France, is social gold. Having correct change was how I wooed Madame Tabac to be my pal. It is how I stayed on good terms with the neighborhood epicier and news seller. 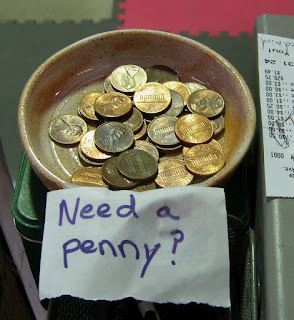 In the rare moments when I was out of change, I always apologized profusely and was certain to make up for my perceived transgression the next time with pocketsful of change. All shopkeepers were always thrilled to have the right coins given to them. When I didn't have my reading glasses handy, they would even willingly help me count out the correct amount if I held up a cupped handful of coins for them. The tension-relieving was palpable. My boulanger, Robert, even taught me the trick of learning the distinction among euro coins by the edge and shape. How important is it to have correct change in Paris? Two vivid anecdotes marked me permanently. 2. At an American performance event in Paris, I was helping as a volunteer to staff the entrance with a fellow expat who had lived in Paris for decades. An American woman arrived and wanted to pay for her discounted 8-euro ticket with a 20-euro bill. We had a well-stocked cash box with lots of change. My fellow American -- American! -- unleashed a tirade. "We can't let you in unless you have the correct change -- no, no, no, that won't work at all!" I froze. "Um, Tim," I whispered in an aside, "we actually do have enough change in the till to let her pay with a twenty." He wouldn't budge. The poor woman was about to leave in tears, when along came another American concertgoer who had change to share with her, so we were able to broker a deal. Tim had clearly been living in France too long. What IS it about making or not making change -- the currency of everyday living -- that makes us who we are? General anecdote number 3: I walk. A lot. In the U.S., on my walks, I invariably come across coins on the sidewalks and street curbs. Ranging from one penny (which I'll pick up if it's heads up and not in the middle of traffic) to the high-water mark, which was a $10 bill. Average is about 15 cents per one-hour walk. In all of my walks in Paris, I never once saw abandoned change on the pavement. Not once. I realized, this weekend, that there is a vestige of the Parisian resident in me that it's not so easy to shake. I still expect the person at the cash register to be appreciative of my ability to give small change. But -- is it chump change? And who is the chump? Um, no offense, Iceland. But, really? I have to look at this ad every day on my way to work. Irk! I love aurora borealis as much as the next person. But the best part of a trip to Paris is Paris. The Polly-Vous Francais challenge: besides Paris in general, what do you think is the best part of a trip to Paris? p.s. Yes that's me taking the photo. Sorry for the glare.